The NFL playoffs have been on the edge of your seat exciting this year. This past weekend we had Pittsburgh come back in the 2nd half after being down 21-7 to Baltimore to win the game 31-24. Go Steelers! The Green Bay Packers went to Atlanta and took care of business, crushing the Falcons 48-21. The Chicago Bears ended the Seattles Seahawks cinderella season with a 35-24 win. And finally, the New York Jets did the unthinkable by going to New England and upseting the Patriots 28-21. 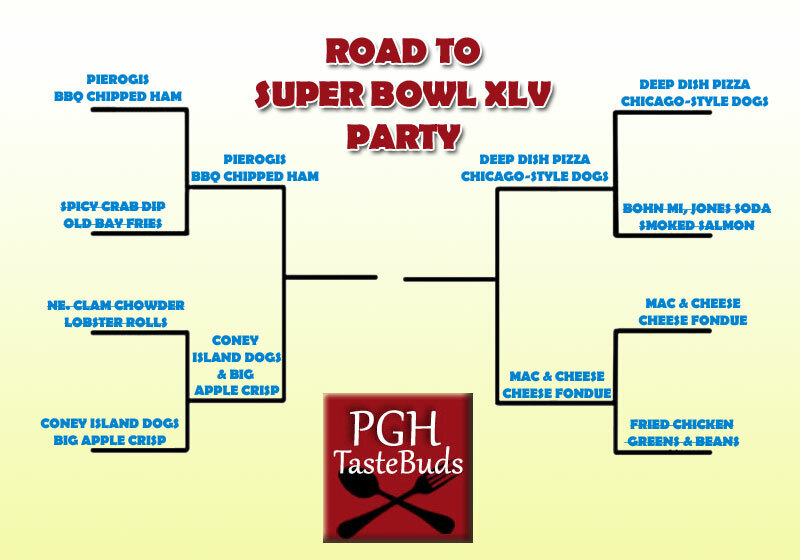 Other than being highly excited that our Steelers are only one game away from a possible Super Bowl birth, but we are now one weekend away from knowing the final food selections for our Super Bowl Party! As you see from the above bracket we have listed the main food topics for each city. As we have said before, we will honor only one city for the Super Bowl. If Pittsburgh goes to the Super Bowl we will have no option but to do a Pittsburgh themed party. Once the games have been played and the winners are selected, we will make our selection based on what will be the most fun for our guests and we will post the actual menu and recipes ahead of time if you wish to make the same food options. Good luck to Green Bay and Chicago this weekend. And to the New York Jets…you are going down! Go Get’em Steelers!